Denis Leary had a routine, some years ago, about wanting a ‘beer-flavored beer.’ Nothing with a story, no major lengthy explanation about the beer’s pedigree, just a straightforward beer. There are times I agree with him. It’s easy to get lost in a world of rum-barrel aged, strawberry-chocolate, triple coffee infused, bacon laden, quadruple-fermented, 10 kinds of yeast and 20 different hops Imperial Belgian Porters only to be served in a blown glass snifter with a mouth circumference of approximately 25.33 cm. Sometimes I just want a beer. But I want it to taste good, too. Luckily, there are some options for Florida craft beer drinkers wanting something simple. Options that don’t involve lowering yourself to watered-down mass-marketed beer. 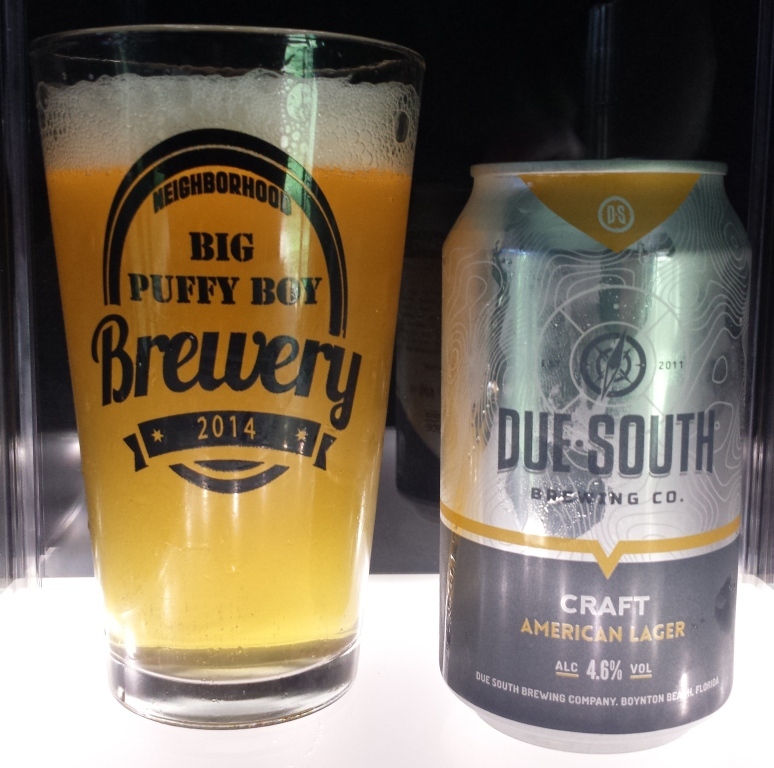 Options like Due South’s Craft American Lager (Pilsner, 4.6% ABV, 20 IBU). But I love beers with stories, of course. An the fact that this beer exists is a testament to how well Due South is doing as a business. This beer was lagered, which is a fancy German term for ‘letting it ferment at colder temperatures for a long period of time.’ And before I go further, I know the direct translation is ‘to store.’ Yay German 101! Anyway, lagering is expensive for a brewery. In the time it takes to properly lager a beer, you can be done with two batches of an ale. The fact that not only can Due South lager beers, but produce enough to can and distribute, is quite something. They have come a long way, and the beer reflects this. Craft American Lager is smooth and flavorful. It has a clean, crisp maltiness that gives the beer a lightly sweet aroma and snappy kick to the nose. The color is a little bit darker and just a touch murkier than a traditional, overprocessed pilsner. The taste is lightly bready, with just a touch more hops that you may find in some traditional pilsners. It’s never overpowering. Everything works quite well together and keeps the beer light, sessionable, and very tasty. According to Brian from Due South, this beer was originally going to be a seasonal release titled “Summertime Craft Lager” and would be more like a Dortmunder, Pilsner’s slightly less hoppy cousin. Since the beer sold so well in Due South’s tasting room, it was decided to make it a year-round release. In fact, this beer is projected to be one of their best selling, if not their best selling, beer within a few years. That’s for a good reason. It’s a fantastic example of what beer can be and would serve as a great craft beer entry point. Then you can go back to raiding the pantry for bizarre ingredients for your porters (which Due South also does very well, I might add).